It’s no secret that many newspapers are seeing plenty of defections for The Athletic, the well-funded startup that’s ambitiously expanding. The company has reportedly offered many writers 15-36 percent pay boosts and small stakes in the company, to say nothing of their focus on features rather than print deadlines and video hits, and that’s a compelling offer for many. But that has some at their former companies annoyed, and Cleveland.com president and editor Chris Quinn (Cleveland.com is the umbrella site owned by Advance Publications/Newhouse Newspapers, and is closely linked to the Cleveland Plain Dealer) showed that in an unusual way Saturday, sending an angry internal all-hands email over the impending departure of basketball writer Joe Vardon (one of several NBA hires The Athletic announced Monday). …I say all this because I suspect the onslaught will continue. If you get one of these limited-time offers, please take the time to talk with the folks here before making a rash decision. If they go under, a lot of veteran sports writers will be out of jobs in a suddenly glutted market. I’d hate for someone on our team to be one of them. Look, some skepticism about The Athletic’s long-term prospects is reasonable. The sheer amount of staffers they have means they’ll need a lot of subscriptions to be profitable, and while their massive funding to this point means they don’t have to worry much yet, it’s far from certain that this will work for every team and every city where they currently have a presence. And yes, this could well go sideways and hurt those who jump. But it’s a bit rich for someone to suggest that newspaper or newspaper-linked digital content jobs are somehow safe or reliable in 2018 either, as we see countless layoffs there all the time. And while some may like Cleveland.com’s coverage better than The Athletic’s, there are plenty on the other side of that as well. 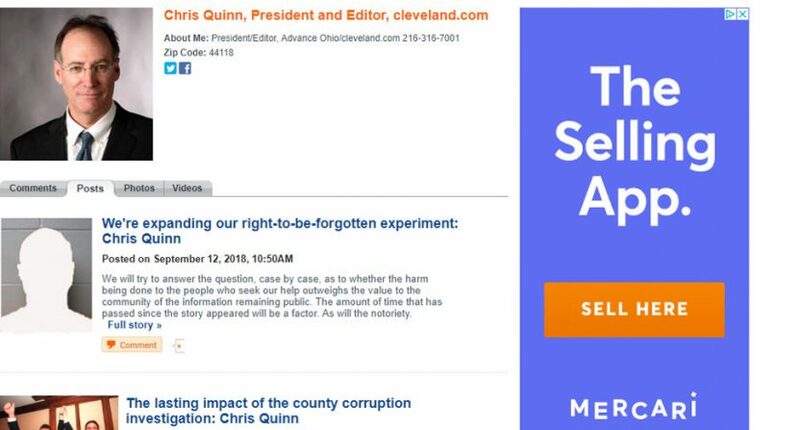 It’s far from assured that “the kind of content we produce” is better at Cleveland.com. Beyond that, though, the really remarkable thing is Quinn saying the quiet part out loud. Staff poaching by a digital startup is a reasonable thing for an editor to complain about over coffee or drinks with colleagues, or even in an email to other editors or bosses, but sending an all-hands e-mail about this is a step further. And how Quinn did so is pretty insulting; he implies that journalists who work for him aren’t capable of looking into offers and making a reasoned decision, claims that he knows better than anyone that The Athletic will fail, and even issues a veiled threat (“I’d hate for someone on our team to be one of them”). That’s particularly obnoxious when you consider that Vardon was one of the recipients of this email. However, there’s even a difference between those general comments of Mather’s (aimed at the entire newspaper industry) and the comments from Quinn, aimed specifically at one competitor and suggesting that his staffers are too dumb to evaluate job offers from that competitor on their own. And it’s worth noting that not every newspaper has seen such huge losses to The Athletic; for example, The Washington Post kept their talent despite offers, forcing The Athletic to look elsewhere. Yes, they have more resources than many, but it’s certainly possible to improve things for the talent you already have instead of whining about a new player in the space stealing your talent with better offers. Of course, part of Quinn’s job is trying to retain talent, and that may have motivated him to send this email. But from this standpoint, that’s not going to work out so well for him. This isn’t a “We’re sorry to see talented people leave, but we’re looking forward to bringing in others” email, or even a “What can we do to make things better for you?” email; it’s an unnecessarily fearmongering email, and one that doesn’t appear to have a lot of factual basis right now. No one’s clear exactly what The Athletic will look like in a year or two years, but at the moment, it seems difficult to say that jobs there are inherently more threatened than those in the newspaper industry. And while Quinn’s arguments about the challenges The Athletic may face could have some merit, he’d probably be better off making those quietly to other people who he’s worried about losing instead of putting them in an over-the-top email blast that was certain to get quoted elsewhere. The frustration’s understandable, but the response isn’t a good look. And it may not do much to help Cleveland.com avoid further losses.